This is an epiphyte frequently growing into large pendulous masses on the branches or trunks of trees, mainly in the rain forest areas from Mt. Dromedary on the south coast of New South Wales northwards to the Bunyah Mountains in south eastern Queensland. The stems are slender, wiry and branching, often quite long and usually tangled. Thin creeping roots develop freely from nodes at the branches. The distinguishing feature of the numerous shiny, thick flat, ovate to lanceolate leaves is the sharply pointed tip. The flowers are usually single but sometimes 2 or 3 per inflorescence and are 2 to 2½ cm in diameter. The petals and sepals are light green, the labellum pale with bright red or purple markings. The flowering season is September to November. 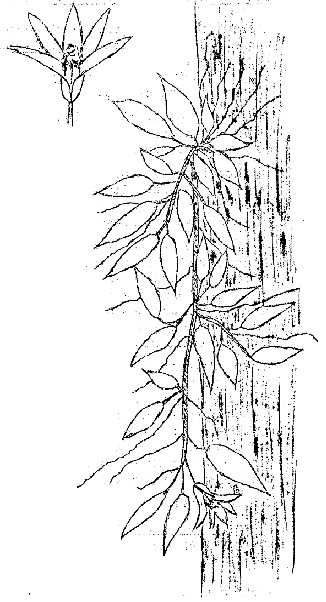 Most authorities designate it an epiphyte, however, in “The Orchadian” Vol. 4, No. 2, p. 24 (1972) D.L. Jones reports having found a bleached and tough looking plant growing on Alum Mountain with its roots amongst leaf litter in a crevice. Again in “The Orchadian” Vol. 7, No. 7, p. 164 (1983) G. Walsh describes ‘inter alia‘ lithophytic forms of D. pugioniforme growing in the Illawarra District of New South Wales. In view of this it could possibly be grown in a pot, but as it grows quite readily on a slab I have felt it pointless to possibly waste a plant just to grow it in a pot. Fertilise in the growing season with foliar fertiliser at half the recommended strength. Two naturally occurring hybrids of D. pugioniforme have been recorded – D. pugioniforme x D. tenuissimum and D. pugioniforme x D. beckleri but they are relatively rare (Ford, “The Orchadian”, Vol, 3, No. 7, p.88: Dockerill, Aust. Indig. Orch. Vol. 1, pp 370-371) and as yet it has not yet attracted the hybridists as there does not appear to be any registered crossings. This entry was posted in Growing Epiphytes/Lithophytes and tagged Adelaide, Australian orchids, Dagger Orchid, Dendrobium, Dendrobium pugioniforme, epiphytes, Growing Ephiphytes, Native Orchids, orchids, South Australia, Wild Orchid. Bookmark the permalink.